Just like our wonderful, fun, educational and engaging summer camp program, our Spring Camp Program is equally as exciting and designed to fit into a parent's schedule. You can come for one day or the whole week! Projects change from day to day. Our Spring Camp is project-based, one where kids learn multiple techniques while creating their project. So whether they are knitting pirates, hand sewing mermaids, machine sewing and hand embroidering book bags each project is designed to teach multiple techniques with an artistic and engaging process. BEFORE & AFTER CARE AVAILABLE FOR ALL SPRING CAMPS! Don't see your dates listed here? We can create a camp for you! Picture your child in the care of energetic and imaginative counselors exploring the world of needle-arts. 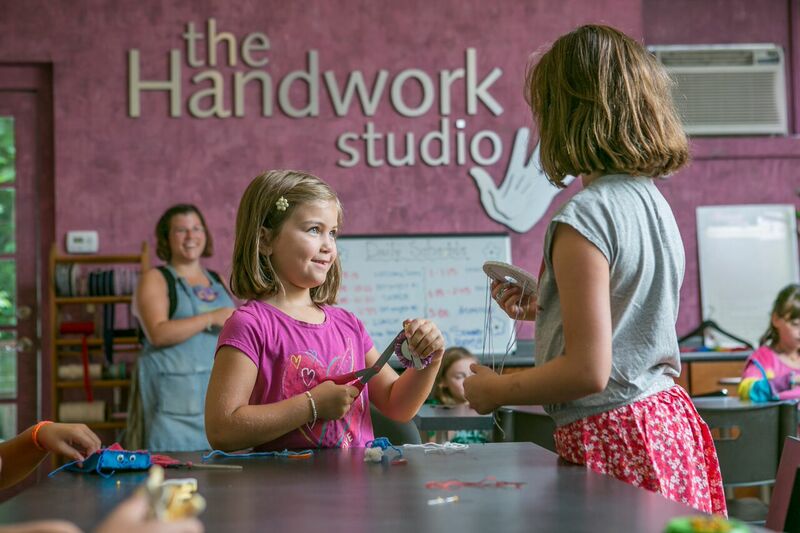 At Handwork Day Camp, you’ll find campers sharing stories and laughs while working on a wide array of unique projects. Our goal is to teach useful skills such as, hand-sewing, embroidery, knitting, weaving,needle-felting and much more! Campers are always free to express themselves and are enveloped in creativity and fun. Whether refining skills or learning brand new ones, our camp is sure to delight. Join the fun with Summer 2019's fresh new curriculum with different projects every week! Whether you are an aspiring fashion designer or a creative camper looking for new skills, immerse yourself the wonderful world of machine sewing! Designed with older campers in mind, this program is all about choice and creative expression. Campers will be taught how to read and use a wide variety of Simplicity Creative Group patterns, our exclusive pattern partner. In addition to a catalog of over 20 patterns, campers get to choose from dozens and dozens of tempting fabrics to bring style and flare to every creation. There are more than enough options to keep you coming back week after week and year after year*. *Please bring lunch and snack.